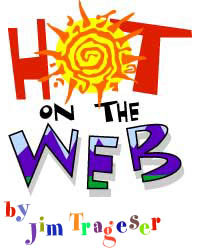 Jim Trageser's Hot on the Web - Were .us domain names mishandled? Were .us domain names mishandled? The .us domain isn't new  you may have seen this domain used already as many schools use the .us instead of .edu. Public schools typically have a k12.ca.us or k12.co.us, depending on the state they're in. Private schools can have a pvt.k12.ca.us or pvt.k12.co.us domain. Now, Americans also have the ability to have a country-name domain. Actually, we've had that ability for a few years  it just hasn't been a centralized, easy-to-figure-out process. For instance, I live in Escondido, Calif. Therefore, if I had wanted a .us domain, I would have had to buy trageser.escondido.ca.us. Now, I can buy (if it isn't already taken) trageser.us simply by going to almost any of the domain-registry service companies. However, this being the United States, this decision to offer the .us names in a more organized, widespread manner has not been without controversy and complaint. The federal government awarded the contract to administer the .us domain last fall to Neustar, which had to set up an advisory council to help develop policies for awarding .us domains. True to form, of course, some groups are upset  charging that Neustar has screwed it all up. Chief among the complaints is that bidding on .us domains is on a first-come, first-serve basis. While some 52,000 .us subdomains have been reserved (mostly 800 numbers, per the government's instructions), some activists complain that the open bidding system favors commercial interests over non-profit groups. A spokesman for the Center for Democracy and Technology (who names these groups, anyway?) was quoted by the Reuters news agency as saying, "Here's a public space that we just allowed to be strip-mined," referring apparently to potentially valuable domains like music.us to be sold off without an auction or hearings. Still, anything this centralized has to be an improvement over the disorganized mess that existed before. After spending more than an hour trying to find out how, I still couldn't tell you how to register a state-level subdomain like trageser.co.us or trageser.md.us. I did learn that all state domains are based on the two-letter postal abbreviation, and that all are, of course, reserved. But if we need anything out of this, it's more organization, not more hearings. If the government, which owns .us on behalf of we citizens, wants to reserve a few more thousand domains to keep the non-profit groups happy, who's really going to complain? Let them have them. Just come up with a system that makes it easy and understandable to register a domain anywhere in the .us master domain  by state, by county, by city. I may want to identify my online presence not only with my nation of residence, but my state or even city  and it should be easy to do so, and to choose from all available options.